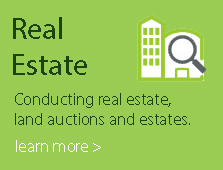 A Real Estate Auction is an accelerated method of buying and selling real estate. It is an intense and fast paced real estate marketing process that involves the public sale of property through open, competitive bidding and can be help on locaiton, at our auction house or processed through sealed bids. What are the general difference between public auction and a foreclosure? Generally, a public auction is for sale by owner. The owner is not in financial distress, but has concluded that selling his/her property at auction is the most effective method. As auction marketing moves into the mainstream, more people are finding that selling their real estate at auction to be the most efficient way to maximize value in a very timely manner. A foreclosure, on the other hand, is a forced sale by creditors. This is my first auction and I'm not sure how to bid? Step 1. Register to bid by showing a valid driver's license and obtaining a bidder number prior to the start of the auction. By registering to bid, the buyer acknowledges that they have reviewed and understand the information in the bid packet and the Contract of Sale agreement. The bidder also acknowledges that immediately following the auction, they are prepared to execute the Contract of Sale agreement and to pay the appropriate deposit at that time in a form that has previously been deemed acceptable to the Auction Company. Step 2. Determine how much you are willing to pay for a piece of property. Since your needs and desires are unique, your valuation of the property will be different from anyone else's. Step 3. As the auctioneer progresses in his call for bids, simply raise your hand when you want a bid. If you're not sure if you're in or out, raise your hand again and the auctioneer will keep you in. He will not let you bid against yourself. The auction will be conducted under the total control of the auctioneer. Step 4. If you have any questions, motion for one of the Auction Team members. They are here to help you understand the process completely. What do I need to bring to the auction in order to bid? Potential buyers are required to bring cash, certified funds, business or personal check in the amount of the pre-determine deposit. Always check with us before each sale to determine what form of deposit will be required. Do I need to pre-qualify? No. We normally do not require any pre-qualification to bid; however, if you intend to obtain bank financing, the bank will require you to qualify for their loan. The deposit you make on auction day is not contingent upon mortgaging financing. Are auction sales contingent on inspection? All sales are on an “as-is condition” basis. There are no warranties as to the condition and/or the fitness of the property for a particular use. We do our very best ot provide ample documentation about he auction properties but we encourage all buyers to do their due diligence prior to sale day for their own protection. If I win the auction, what happens to my deposit money? The deposit will count as a credit towards the purchse price of the property and placed in an escrow account. Please note; it is the purchaser's responsibility to obtain financing. If you plan to use a mortgage to purchase the property, we recommend that you apply for the loan prior to bidding on the real estate. When can I inspect the property? Shamrock Auction Services schedules previews on most properties and will make every effort to afford ample access to assist in your purchase decision. What is an Absolute auction? An absolute auction is a public auction without a reserve or minimum price/bid. This means that the property, once the auction begins, will be sold that day to the last and highest bidder. What does the term “reserve” mean? 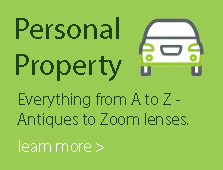 Under a reserve auction the auctioneers will submit the highest and best bid to the seller. The seller has the right to accept of reject that bid. If the property is not labeled as absolute, it will be sold on a reserve basis. The buyer's premium is an amount that is added to the high bid for our auctions. What are the advantages to a buyer in an auction situation? At an auction the buyer knows the seller is fully committed ot sell. Our auction agreements obl;iegate the seller to transfer title to the highest bidder in an absolute auction; likewise the auction agreement obligatesx the seller to transfer title to the highest bidder that meets or exceeds the reserve price in a non-absolute offering. Our buyer knowshe is getting the property at a fair price. A buyer feels committed to the purchase knowing that there is a contending bid just one increment under the purchase price. Buyers set their own purchase price. Auctions eliminate long back and forth negotiation periods. Auctions reduce time needed to purchase property. Buyers do not have to worry about contingencies because purchasing and closing dates are known in advance of the sale. Buyers can receive favorable pre-sale financing. Due diligence is performed in advance of the sale. How long do I have to close on the property? The time frame varies depending upon the type of property to be auctioned. Generally, our contracts stipulate a 45 day settlement from the day of the auction to closing for residential properties and up to 45 days to closing on commercial properties. Should real estate agents look favorably on auctions? Increasingly, more and more real estate agents are discovering the benefits of real estate auctions. The know that auctions promote action in an industry that thrives on activity. Auction provides a list of ready and qualified buyers. Offers your clients and customers many new selling and purchasing options. Increases market share and revenue – new business opportunities are added. Enhances your company's image. You sell more properties in a timely manner. Helps to develop your own market niche by being able to offer new products and services other agents aren't providing. Auctions are events that appeal to all types of people – an auction brings them in tolook at all the listings you hold, not just the auction listing. Auctions create referral and return business. Builds rapport with auction firms. Step 1. Arrive about 30 minutes prior to the auction time so you can review the rpoperty information and ask any questions you may have. Register to bid with a driver's license, obtain a bid number. By registering to bid, the buyer acknowledges that theye have reviewed and understand the information in the bid packet and the purchase agreement. The bidder must have completed all inspections prior to the auction date at their expense. The bidder also acknowledges that immediately following the auction, they are prepared to execute the purchase agreement and pay the appropriate deposit at that time in a form that has previously been deemed acceptable to the Auction Company. Step 2. Determine how much you are willing to pay for a piece of property. Since your needs and desires are unique, your evaluation of the property will be different from anyone else's. Step 3. As the auctioneer progresses in his call for bids, simply raise your hand when you want to bid. If you're not sure if you're in or out, raise your hand again and the auctioneer will keep you in. He will not let you bid against yourself. The auction will be conducted under the total control of the auctioneer. Step 4. If you have any questions, motion for one of the auction team members. They are here to help you understand the process completetly. Step 1: Register to bid by calling our office. We will explain the deposit required in order for you to bid. Step 2: You will receive a phone call just prior to the auction start time so we can answer any last minute questions you may have. Once the auction begins, you are ready to bid on the phone. Step 3: If you are the successful bidder, you deposit will be sent to our escrow account. You will also be required to execute all original purchase agreements. You are then ready to move toward closing! If you intent to obtain bank financing, the bank will require you to qualify for their loan. The deposit you make on auction day is not contingent upon mortgage financing. For this reason. It is important that you finish your evaluation and inspections of the property and arrange for necessary financing prior to bidding. A buyer's premium is a percentage that is added to the bid price to determine the total purchase price. In most auctions there will be a 3% to 10% buyer's premium added to the successful bid amount to create the total purchase price. Shamrock Auction Services will advertise all buyer's premiums prior to the auction day. How much money do I need at the auction? The deposit will be non-refundable and will be due at the end of the bidding process. In most cases a personal or business check is sufficient; however, it is best to check with our office to make certain that certified funds are not required. The balance due will need to be paid in full at the time of closing. Under a reserve auction the auctioneers will submit the highest and best bid to the seller. The seller has the right to accept or reject that bid; the sell price is subject to seller's confirmation. If the property is not labeled as absolute, it will be sold on a reserve basis. What does the term “aboslue” mean? In an absolute auction, the property will be sold to the highest bidder regardless of price. Unless the advertising says “absolute”, it is a reserve auction. I've never been to an auction before. This sounds confusing? First, you are not alone most people who attend one of our real estate auctions are there for the first time. Second, you will never be tricked into buying something you you don't want. The most important thing to do at an auction is relax and have fun. If you have a question, ask it. We strive to insure that all of our customers are fully informed and educated. Copyright © 2014 Shamrock Auction Services, LLC. All Rights Reserved.